confidentiality and data protection. The staff give daily feedback to parents about their child’s day and how they are progressing. 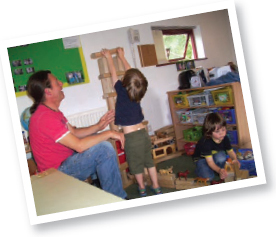 Parents are invited to talk to the child’s key-person in more detail about how their child is learning and developing. We keep parents informed, about what is happening in the nursery, by regular Newsletters, notices displayed on the Parent Notice Board, and by daily communication. Children are encouraged to take home “Barnaby Bear” for the weekend to encourage personal and social development. We ask that parents complete Barnaby’s diary about their experience. We encourage Parents to telephone during the day if they wish to check on how their child is doing. No charges are made for a period of settling in visits (up to 2 hours) in order for you to share information with your child’s key person. 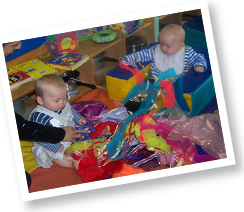 Parents are welcome to visit at anytime during the day, we operate an open door policy. Mothers breast-feeding their baby are welcome to continue this practice if they are able (work permitting). invitations to several events we hold with the children throughout the year. Staff - Our staff are qualified up to level 6 in childcare and education and attend regular training to update their knowledge. Area Managers are available to monitor and support staff in mplementing all policies and procedures. 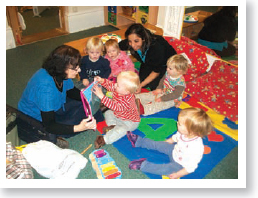 Area Managers are regularly in nursery to monitor staff performance and the quality of care and education given. 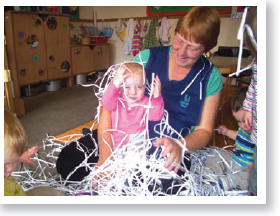 Key Person - Each child is assigned a key person who has special responsibilities working with a small group of children, giving them reassurance to feel safe and cared for and building relationships with parents. Together, key persons and parents can ensure the needs of the child are being met, and progress is shared. access fresh drinking water throughout the day. Bags are provided for you to keep a spare set of name labelled clothing. check on everyone entering the nursery. CCTV is in operation in all the nursery playrooms. each month. A late payment surcharge is levied if fees are not paid by the 5th of the month. of your child until payment is made. Fees are not refundable due to sickness and holiday etc. One months notice in writing, or payment in lieu of notice, is required if you wish to withdraw your child from the nursery, or reduce sessions. employees. Education Grant Funding is available for 3 and 4 year old children. fall within periods of closure are not transferable. Holidays include a 1 day closure per term for children in receipt of the education grant; this day will be used for staff training. There can be no substitute for a visit, so please telephone and make arrangements to come and see us at any time.